Fall is in full swing here in Atlanta. Although located in the Deep South, known for its steamy and humid summers, the ATL does (somewhat) experience all four seasons. Watching the fall leaves turn from green to the splendid varieties of gold, yellow and red in fall is a spectacular experience that never gets old for this Florida girl. 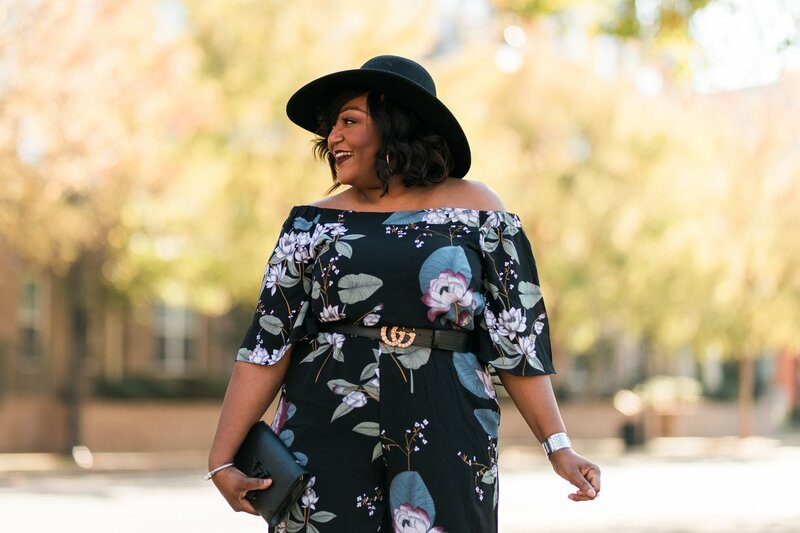 This off shoulder jumpsuit from City Chic compliments the season perfectly. The colors, the blossoms, the leaves make this so fall appropriate. 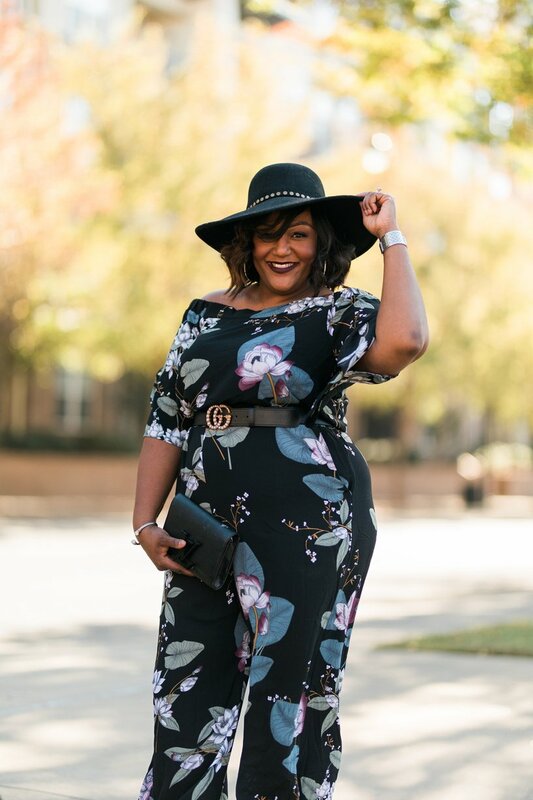 It is probably the most flattering jumpsuit I own, and I own plenty! (Read my previous jumpsuits posts here, here & here.) This one compliments the curves and accentuates the bum — all A pluses in my book. 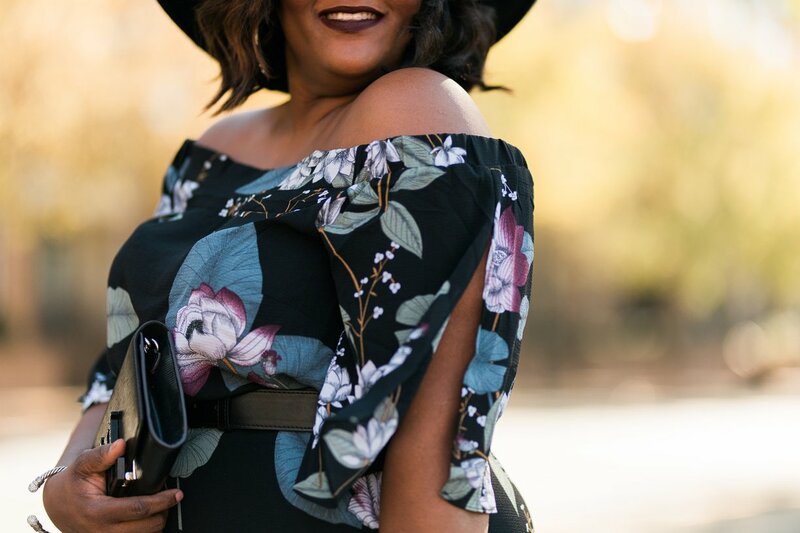 The elasticated shoulders allow the top to lay nicely across the décolletage too, giving a little bit of sexiness to boot. 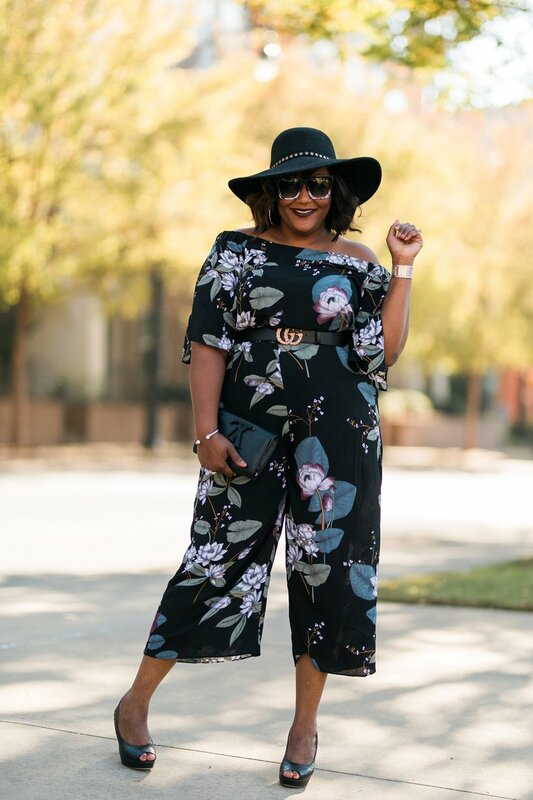 I love a good jumpsuit and this one is really, really good. 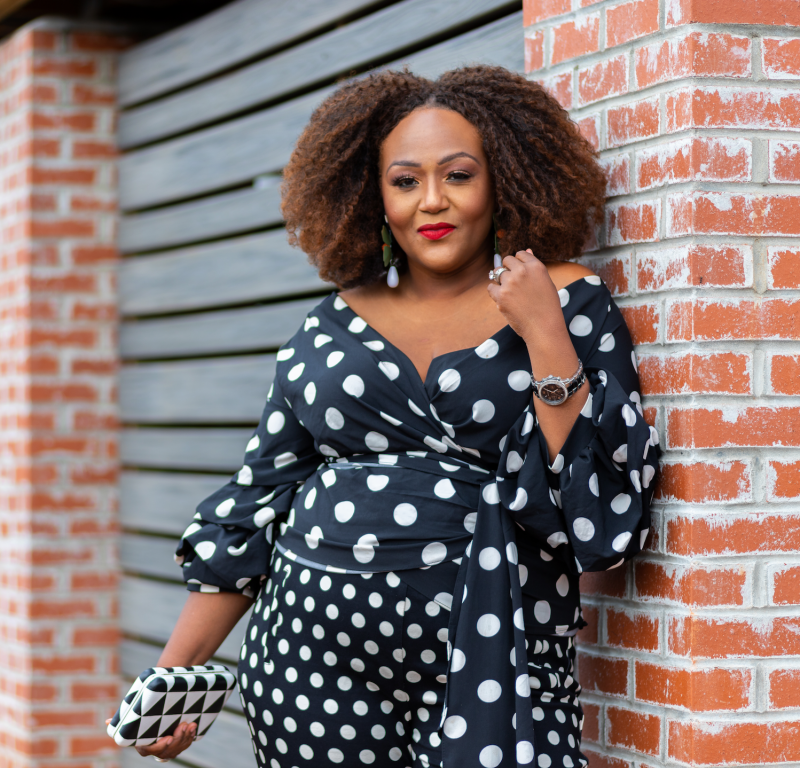 The fabric is lightweight and the wide-leg is figure complimentary, helping to minimize fuller thighs and wider hips. 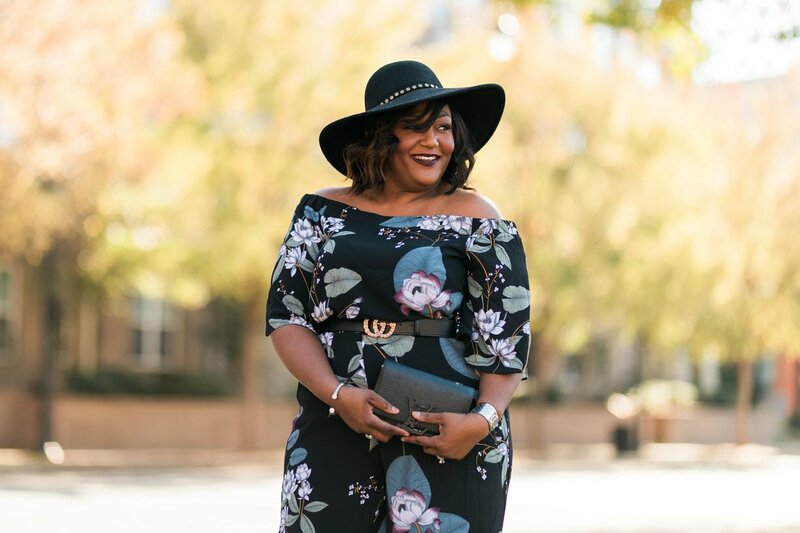 Some plus women fear wide leg pants as they think it makes their bodies appear bigger. Not so with this jumpsuit. The cropped bottom and higher waist help to eliminate that fear as the cut elongates the body. 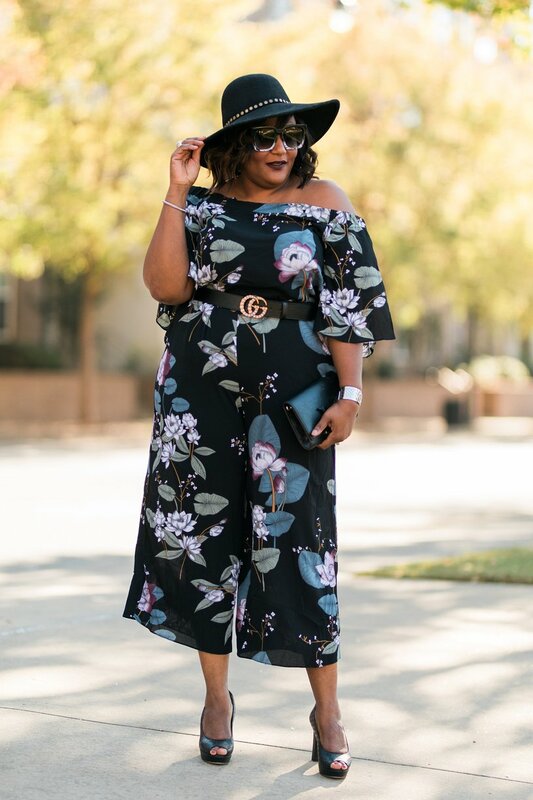 Whether you sport your jumpsuit with sky-high sandals or a funky pair of retro sneakers, my advice is to choose a style that flatters your figure and then rock the hell out it! 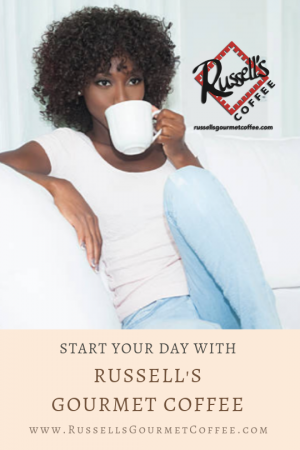 Include this one or this one, and you are sure to wow! 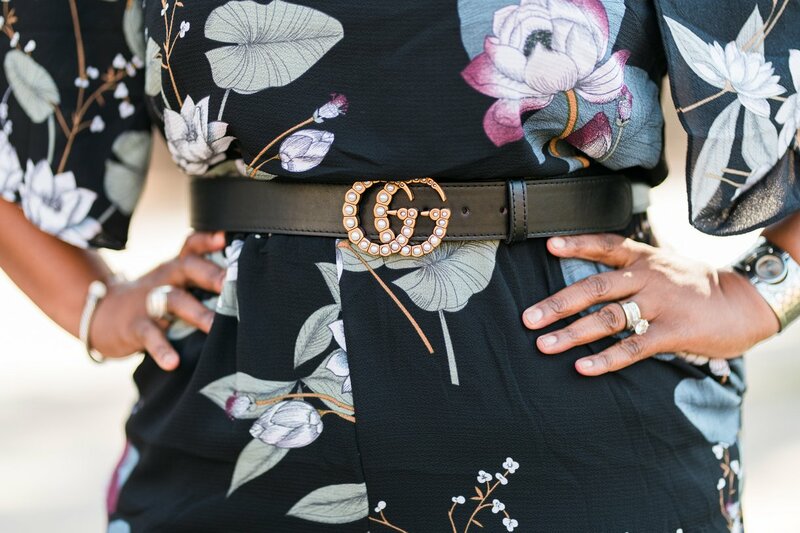 There is a removable matching waist tie with this jumpsuit but I opted to wear my new pearl buckle Gucci belt. The Freehive knows how much I love Gucci and mixing luxury accessories with affordable clothing. The jumpsuit is unlined (YES!!!) and has side pockets. It has pockets, y’all! Lately, I have been really impressed with City Chic’s offerings. Seems the clothing is more classic and the quality has greatly improved. 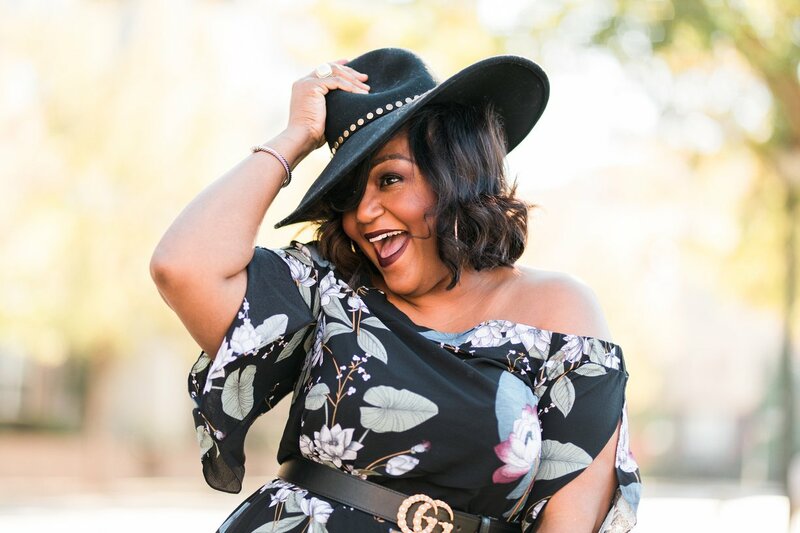 That’s not to say the brand hasn’t offered great clothing, it just wasn’t consistent in my opinion when I shopped the now-closed City Chic store in Westfield Mall in Culver City, California. City Chic clothing is available online at CityChicOnline.com, Asos.com and in-store at Nordstrom’s, Macy’s and Lord & Taylor, to name a few. This versatile jumper can easily transition from Fall to Summer and Spring, a major benefit in owning this piece. More ways to style this jumper are forthcoming. Stay tuned. And as always, thanks for stopping by. *This post is sponsored by City Chic. All opinions are my own.